Dr. Sweger: In this paper I compiled 2 years of data showing the relationship of both relative and absolute humidity and daily temperature in two different locations on the continent of Africa. 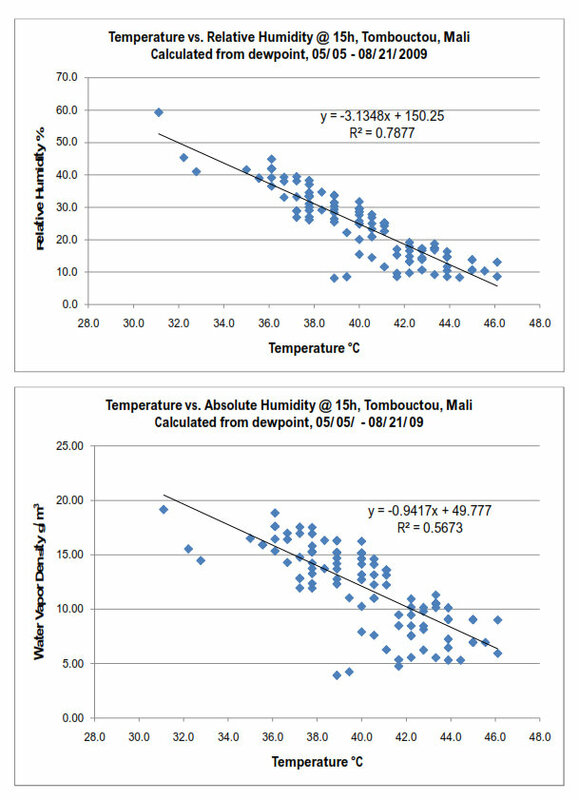 In this paper I demonstrated that the correlation of humidity and temperature is clearly negative. Dr. Sweger: I agree, and for the same reason that during the day high humidity slows the increase in temperature. The reason is that heat energy only flows in one direction: from a higher to a lower temperature. It is the same as in an electrical circuit. Electricity only flows from a higher potential to a lower one. During the day the energy from the sun is flowing from the sun towards the surface of the earth. The high specific heat of water impedes the flow of heat in the same way as a higher value of a resistor impedes the flow of electrons. At night the situation is reversed. Now the heat energy is flowing away from the earth into a very cold space, and the presence of water vapor impedes the flow of heat energy away from the earth’s surface. Thus the surface temperature decreases less on a humid night than a dry night. The purpose of the paper was to demonstrate that any feedback loop between the effect of “greenhouse gases” and the earth’s surface must be negative, since it would result in an increase in water vapor, and thus an increase in the impedance of heat flow. "In the positive feedback mechanism as proposed by the global warming proponents this behavior would be reversed. Then the data would show a positive relationship between moisture content and temperature. But it does not. As suggested before, data is the language of science, not mathematical models." Semi-retired physicist Dr. Daniel M. Sweger has been a research scientist at the National Institute of Standards and Technology, where he was active in a variety of research areas, including cryogenic thermometry, solid state and nuclear physics, and molecular spectroscopy. Dr. Sweger's new paper, Earth’s Climate Engine (PDF), finds that if carbon dioxide has an effect on climate, it must be negligible. Instead, he finds on the basis of data and theory that water vapor is the dominant influence on climate, and its influence is the opposite of that assumed by the IPCC climate computer models. … While models can be useful, the results must be compared to actual measurements, i.e. data. Data is the language of science, but little has been done in that regard with the climate change models. It is the premise of the author that water vapor is the dominant influence in determining and understanding global climate. Water vapor is much more abundant in the atmosphere than carbon dioxide, and its physical properties make it more important as well. During daylight hours it moderates the sun’s energy, at night it acts like a blanket to slow the loss of heat, and it carries energy from the warm parts of the earth to the cold. Compared to that, if carbon dioxide has any effect it must be negligible. Thus, the purpose of this paper is to explore the effect of water vapor on climate. Detailed calculations and analysis of data from several locations clearly demonstrate that the effect of water vapor on temperature dominates any proposed effect of carbon dioxide. Furthermore, it is clear from the data presented that water vapor acts with a negative feedback on temperature, not a positive one. That is, the data demonstrate that increasing the level of water vapor in the atmosphere results in a decrease of temperature,not an increase as predicted by the climate models. In essence, atmospheric water vapor acts as a thermostat. These results call into question the validity of using the results of the current general climate change models, particularly as the basis for policy decision making. The high specific heat of water vapour is relevant but there is another mechanism involved as well. Being lighter than air water vapour rises higher and faster especially when the latent heat of condensation is released. The higher it goes the more of its kinetic energy is converted to gravitational potential energy which is then available to be returned to kinetic energy in the descent of dry air. i) During the ascent the vapour cools the surface by taking kinetic energy upwards and converting it to gravitational potential energy. Only a portion of its energy is lost to space by radiation. ii) During the descent the dry air warms the surface by converting gravitational potential energy back to kinetic energy. It is the energy (kinetic energy and gravitational potential energy combined) locked into the convective cycle of uplift and descent which raises the surface temperature some 33C higher than the S-B expectation. How on earth does he come to that conclusion?